Late junction (BBC) presenter Fiona Talkington explains how an exceptional young Tunisian musician found his creative home in Europe, and how his first three albums came about. A small seaside town in Tunisia in the 1970s. A boy walks along a deserted shoreline picking up the odds and ends he finds lying around: A broken fishing net; a few discarded sardine cans; spokes from an old bicycle. His heart and mind are full of music and he wants to play. It’s as much as his father can do to put food on the table for Dhafer and his seven brothers and sisters. There certainly isn’t spare money for music lessons, let alone for an instrument. 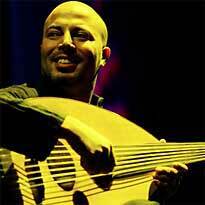 So Dhafer makes his own oud, the traditional middle-Eastern lute, using whatever he can find. first minute or so of Dhafer Youssef’s last album Digital Prophecy to hear how the passion for music, born in that small Tunisian town, still lives on. Vienna lured him with the promise of the opportunity to study music. The world was beginning to take notice of Dhafer’s captivating high vocals and intensity of playing and he considered settling in New York.